To celebrate the inclusivity of tennis and as part of Nature Valley’s commitment to driving participation in tennis in Britain, Nature Valley, one of UK’s leading cereal bar brands and official partner of British Tennis, created a full size tennis court in Westfield Shopping Centre, Shepherd’s Bush, and invited tennis champions, celebrities, social media influencers, and the general public, to get on court and play more tennis. 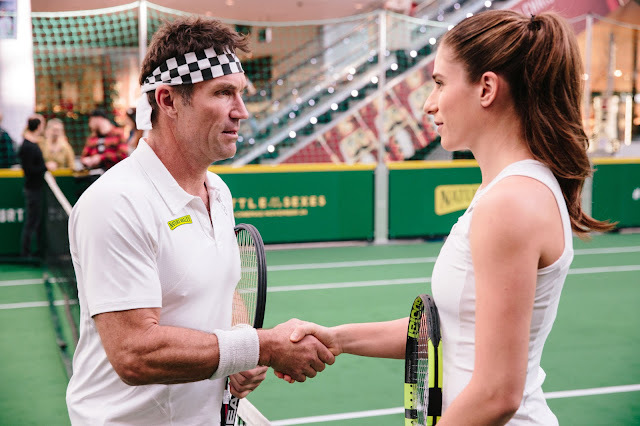 In the match-up, British women’s No 1 and Nature Valley brand ambassador Johanna Konta faced off former Wimbledon champion and ATP legend Pat Cash. This match was inspired by the iconic Billie Jean King vs Bobby Riggs ‘Battle of the Sexes’ 1973 match re-told in the film by Fox Searchlight Pictures of the same name in-cinema 24th November starring Emma Stone and Steve Carrell, for which Nature Valley is the sole promotional partner of the UK theatrical launch. Konta’s winning mentality and impressive fitness ultimately saw her defeat Cash 6-3 in a one-set shoot staying true to the historical event script, but not before both players had gained some help from umpire and compere and ex-British #1 Greg Rusedski, and some willing ball boys and girls joining in the match. After the main match, TV personalities Jamie Laing and Jessica Wright joined to support Konta and Cash on court for a fun-filled Battle of the Sexes mixed doubles before opening the court for players from the general public to get involved in their own ‘battle of the sexes’ rendition. Old and young, skilled and less so, fit and not, the impactful and impressive court hosted many a match throughout the day with tennis being the winner. The court was recreated by Nature Valley as part of its wider campaign The Court is Yours – aimed at getting more people back into playing tennis. The event aimed to showcase how tennis can be played in a number of unexpected locations. The activity has been created and managed by creative agency Space. Nature Valley was also the Official Global Partner of last week’s ATP World Tour Finals, where it saw increased attention around the O2-centred end of season championships involving the top eight ranked male tennis players in the world and the opportunity to remind fans to pick up a racket and play. Founded in 1866, General Mills is one of the world’s leading food companies, which operates in more than 100 countries and markets more than 100 consumer brands. Headquartered in Minneapolis, Minnesota, USA, General Mills had fiscal 2016 global net sales of US $17.6 billion. General Mills UK is an award-winning employer that markets and distributes a number of much-loved consumer brands – including Häagen-Dazs, Old El Paso, Nature Valley, Green Giant, Betty Crocker, Fibre One and Jus-Rol pastry. Yoplait UK is an affiliate of General Mills and is responsible for major brands such as Petits Filous, Liberté and Super Fruitii.